Hello everyone and welcome on in to my Summer Home Tour today! I’m joining in with an amazing group of bloggers…so read on to see the deets. I think that probably with the exception of the Christmas season, my home pretty much has a summery vibe to it year round since I live in a tropical climate. There are definitely some things that help to define that feel without being too trendy and keeping totally true to my own aesthetic. It starts in the big open floor plan kitchen/dining/family room with the white walls and dark stone finish porcelain tile floors. We have lived in this house 25 years now this Father’s Day and there have been changes of course, but the white walls and white kitchen have been in place since day one. This is my favorite area in our home. Since we have lived here for so long, raised our kiddos here, gone through a devastating hurricane (Andrew~1992) by now most things have been updated. The kitchen cabinet boxes are heavy old wood so we didn’t want to remove them, and had replaced doors some years back and the hardware as well. If I had my way at the time we would have gone with white Cararra marble counters, but builder husband said no. I think that the look is timeless, summery and happy. Flowers for color. A definite MUST and in the early summer it’s peony time. What’s my signature style? 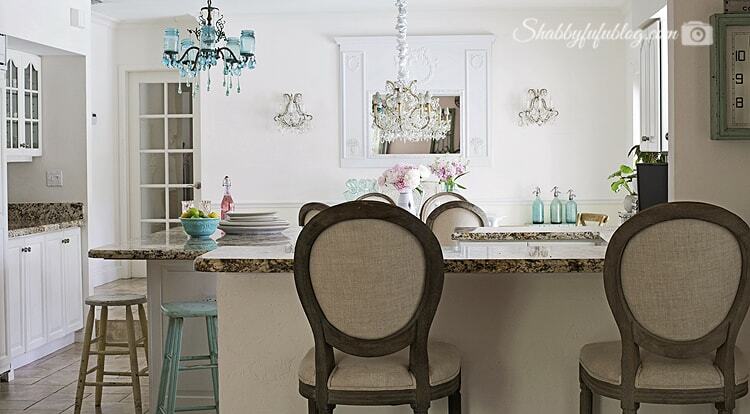 Hmmm, I guess you could say French inspired with a bit of shabby chic, coastal and some elegant glitz tossed in to the mix. I often blog about how I achieved my own style over time and most of what I have here in my home was either free, DIY’ed or low cost. 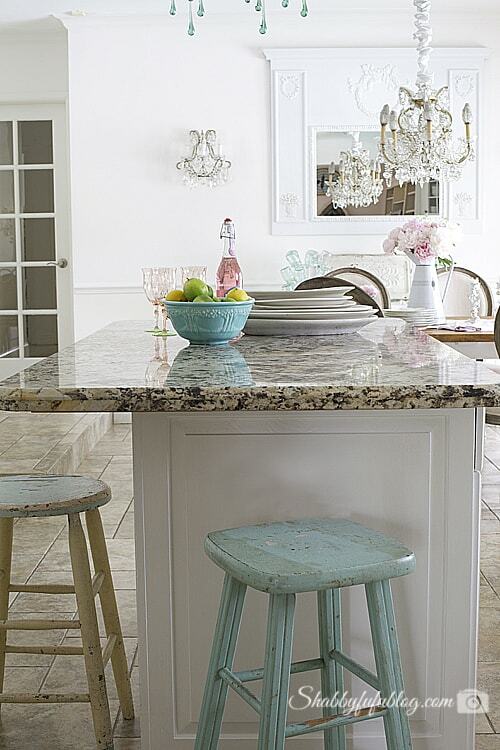 I love old authentic paint finishes on wood, and these vintage stools have that original paint. Although some great paints exist these days and I’ve used them, when I find pieces like these I’m super happy. You can sometimes find pieces like these on eBay (I used to sell there way back when) or flea markets. The Mason jar chandelier is something that I made a few years ago after the husband brought me the rusty old crusty frame from a trash pile. It became a knock~out success and everyone wanted it, so I started selling them in the on~line shop (made by us). I’m pretty proud that we were the first people to do Mason jar chandeliers that I know of! 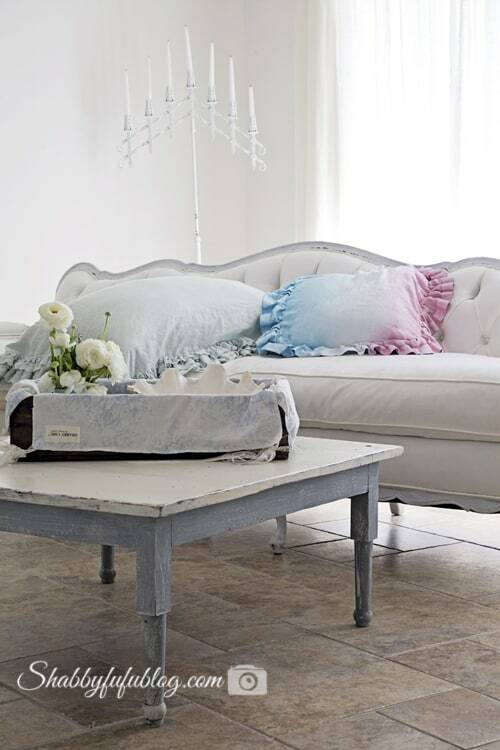 Soft faded shades of blue and pink are my favorite accent colors by far. I collect French enamelware and my dishes are an old set of French Limoges that I bought from a local friend. 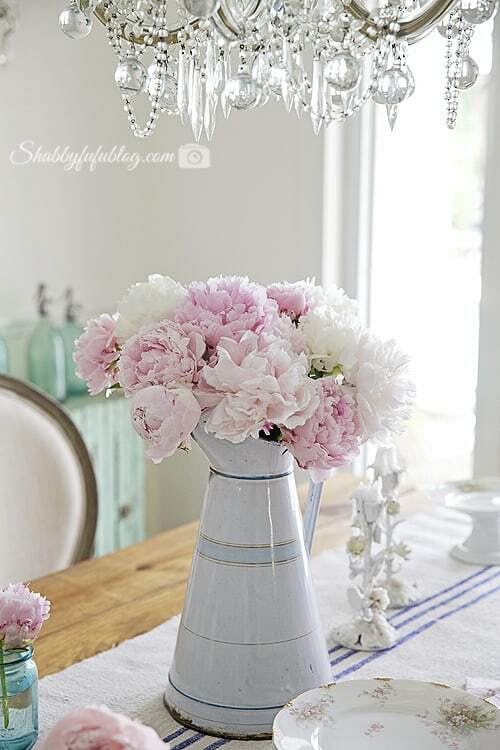 How pretty are these peonies?! A side counter in the kitchen that is under a pantry cabinet. Our kitchen backsplash is done with the palest sea glass tiles from Home Depot. The accents in here are again my soft blues and pinks, and the ombre pillows I dyed with some Rit Dye (from Amazon) after sewing them up from a vintage Irish linen tablecloth that had seen better days. 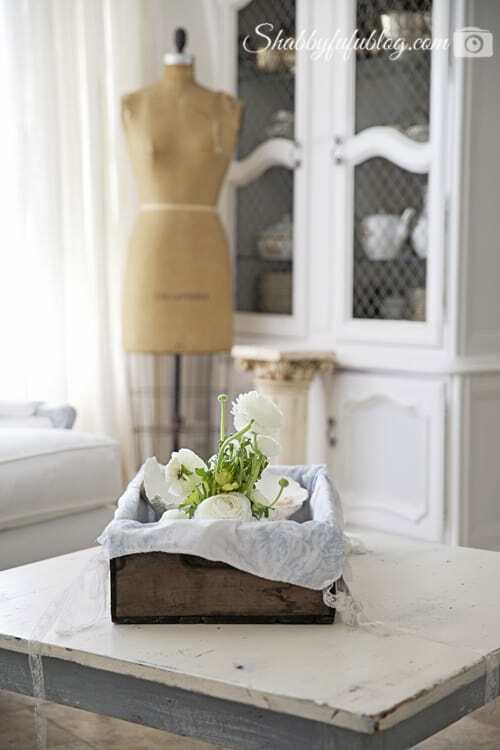 I love to repurpose old linens like that. 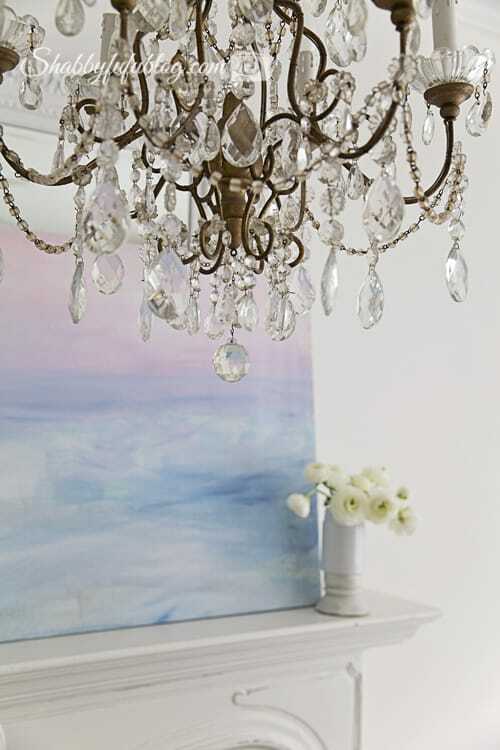 The glitz of a great vintage chandelier goes a long way to bring style to a room. 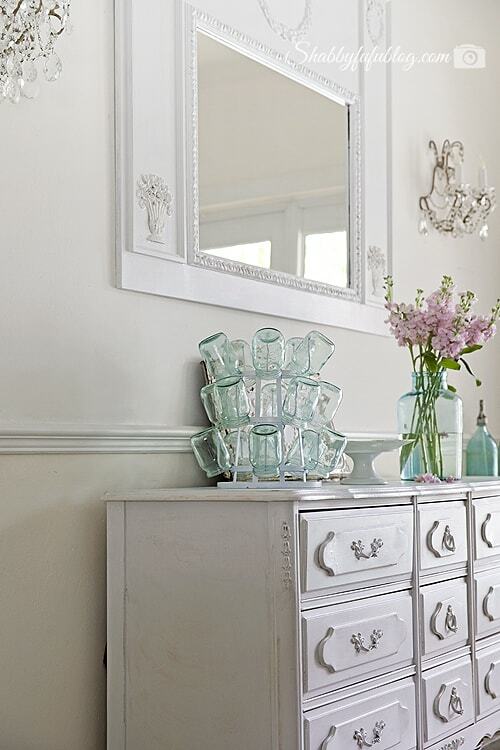 There is not much room in my dining area for furniture, so quietly tucked in a corner of the living room sits this vintage china cabinet filled with extra sets for styling occasions. Over the years I’ve scored some great vintage finds, including this garden table stacking set made of cast aluminum. The paint is original and has oodles of patina and I’ve brought it inside for summer. 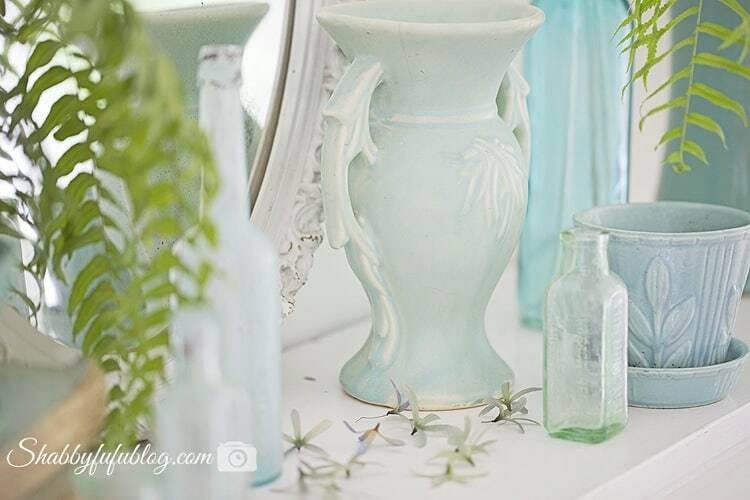 I love to collect vintage garden pieces and bring them inside. In the interest of time the last room on today’s Summer Home Tour that I’ll share is the master bedroom. I’ll share more over the next few weeks on upcoming posts. 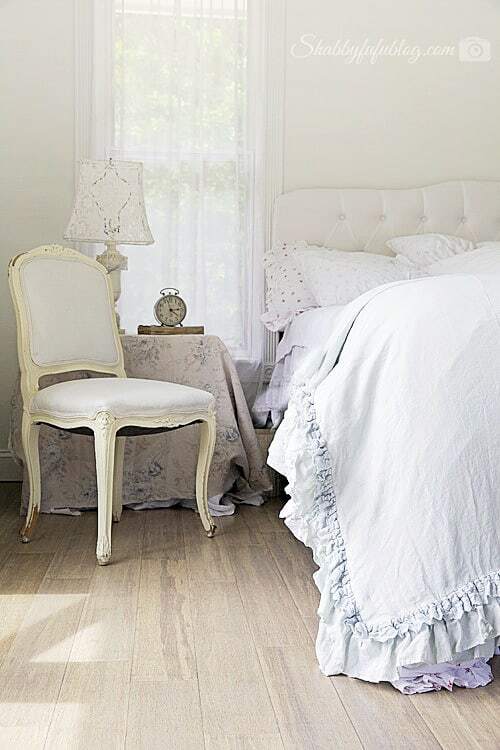 Again, my favorite things…original paint on furniture, lots of white and a few pale accents. Our bed has a tufted white denim headboard that we’ve had for a few years now. I don’t worry about white…it can be cleaned and we have 3 dogs, so that’s my testimony to those who say that they can’t do white! The bed linens are forever changing and the pink cabinet (free from a friend) holds the extras. Opposite the bed is this mantel with non working fireplace that we took out of an old home. 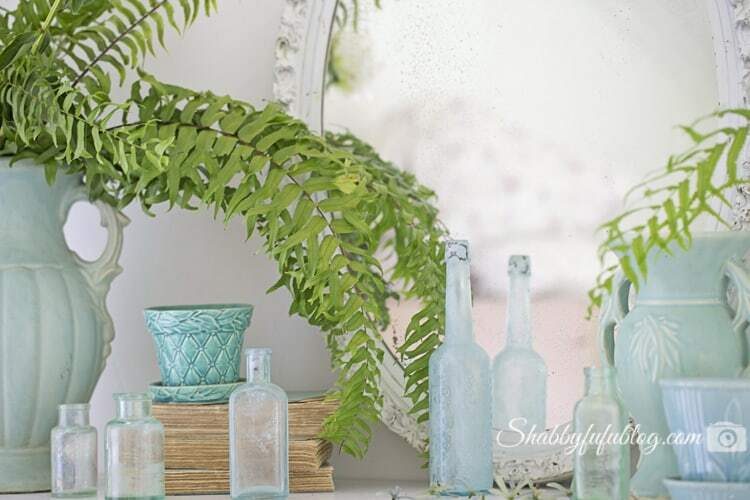 I accented it for summer with a collection of vintage eBay found McCoy pottery and some sea glass vintage bottles and cut some ferns from our garden. If you’ve never cut ferns to bring inside they have staying power and can last for a couple of weeks in water. 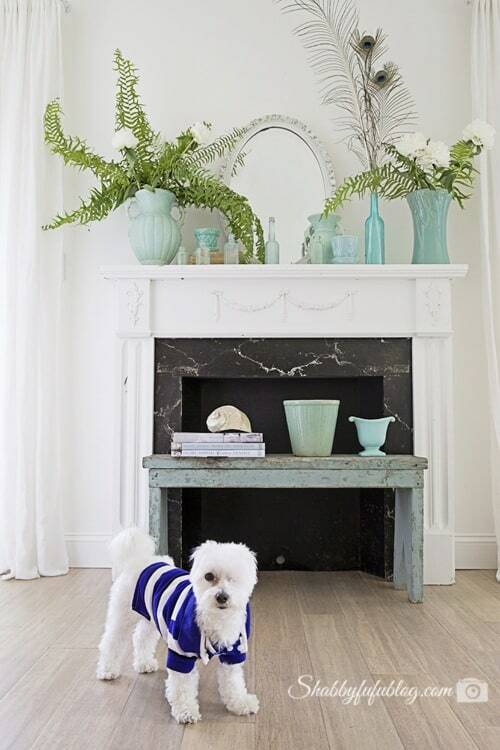 Toby decided to pop in to my shot and his little blue and white striped shirt makes him fit right in to this summer scene. 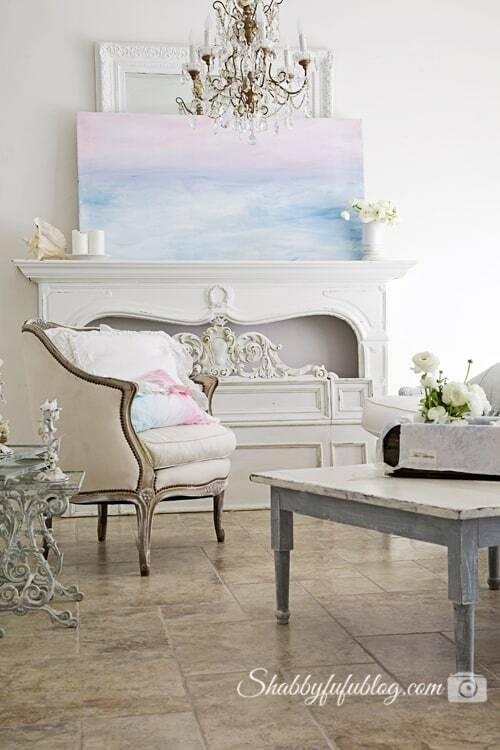 Sweet summer sea dreams on the mantel right now. If you were wondering what’s in the crate on the vintage bench at the foot of the bed, I’m drying flowers. 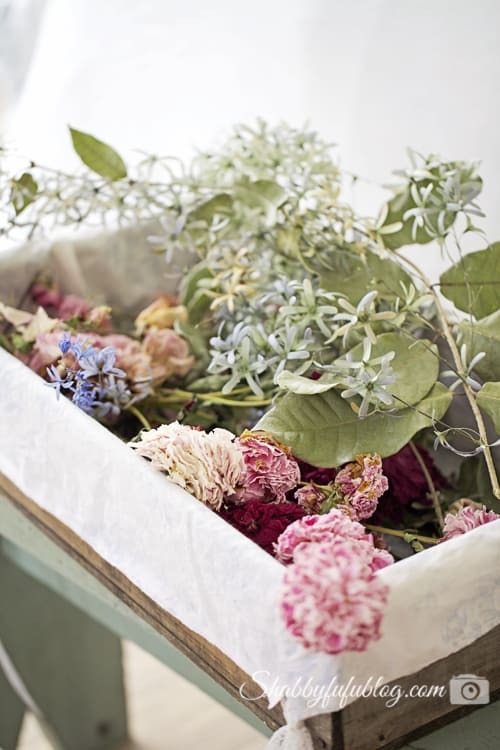 I love the look of dried flowers and so why not in the bedroom so they can be enjoyed! A little bit of vintage shabbyfufu style in the corner. 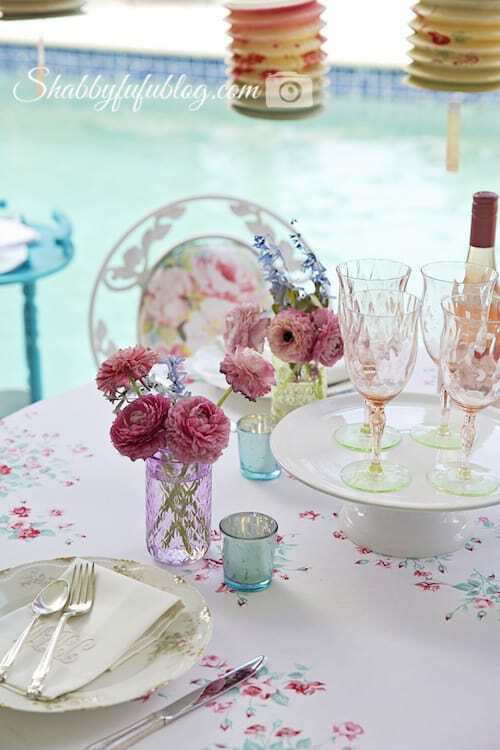 Around the pool ~ summer style entertaining. Down by the water behind our home where it’s quiet but set up for a festive dinner. I love the backyard setting it's so inviting! Thanks for sharing! Your home is simply gorgeous! I love it all, but especially the nesting garden tables! Those are fab! By the way, Toby is a cutie! Janet… there is so much to drool over in your beautifully styled home! I have enjoyed every scrumptious photo! What a beautiful home!!! I adore your feminine, fru fru take on summer. It is so cool and fresh and just fabulous!!!! Janet, your photography is amazing!!!! Janet, thank you for the tour of your most beautiful home. You truly have gathered and made the most wonderful things over time to create an incredible home for you and your family….I am truly in awe of your creativity….Now that my brother has come out of retirement (for a little while) and is working in Hollywood, you may never know who may be knocking on your door!….Also, I did not realize you went through Hurricane Andrew…we did too…such a devastating time!…have a great day Janet! Janet you have such charming taste full of personality and style. 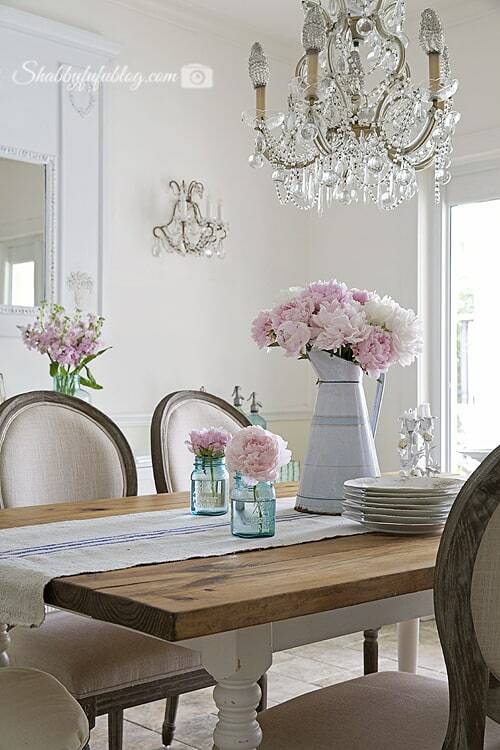 I love the mason jar chande! Beautiful tour and photos. It was delightful to see. I knew it was going to be be – but, wow, it's so deliciously gorgeous AND comfortable-looking. So many beautiful things to see and rest (and relax) your eyes and excite your soul! It's no wonder you are THE Shabby Fufu! So shabby beautiful Janet! You are such an inspiration! It's so lovely Janet. It's feel very open, cool and tropical as you say but with a French vibe. So pretty, Janet and Cody is too cute! 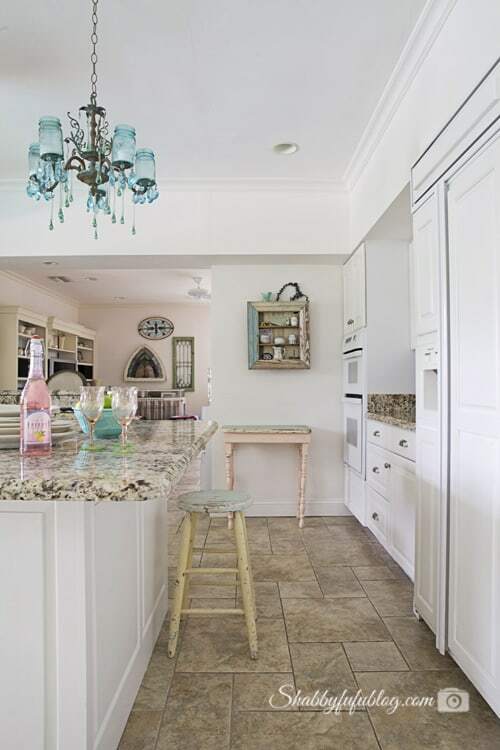 Your home is simply beautiful with the touches of aqua. Thanks for sharing with us. Oh so stunningly beautiful & so very summery Janet! Love it all!! 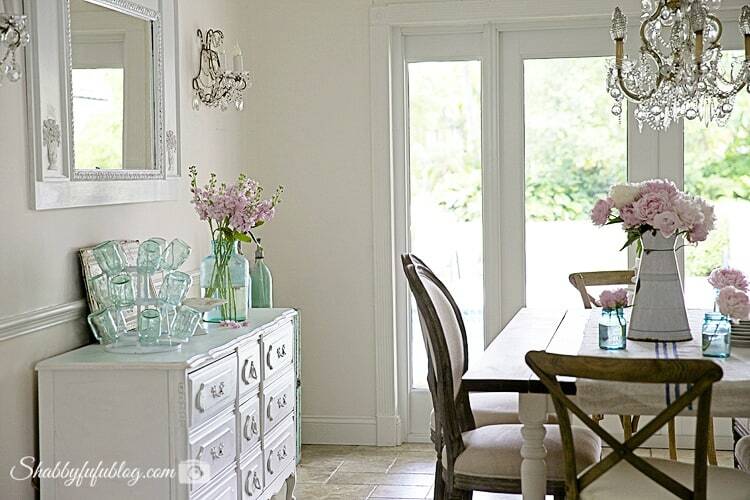 Janet your home is just so, so lovely and overflowing with gorgeousness! It's all so light and bright and perfectly summery. So fun to be part of the tour with you today! Janet your home is just so beautiful! Thank you for always inviting us in. I love the suttle colors of summer. A breath of fresh air, truely. What a beautiful home – it's hard to believe it was all free, DIY, or low cost! 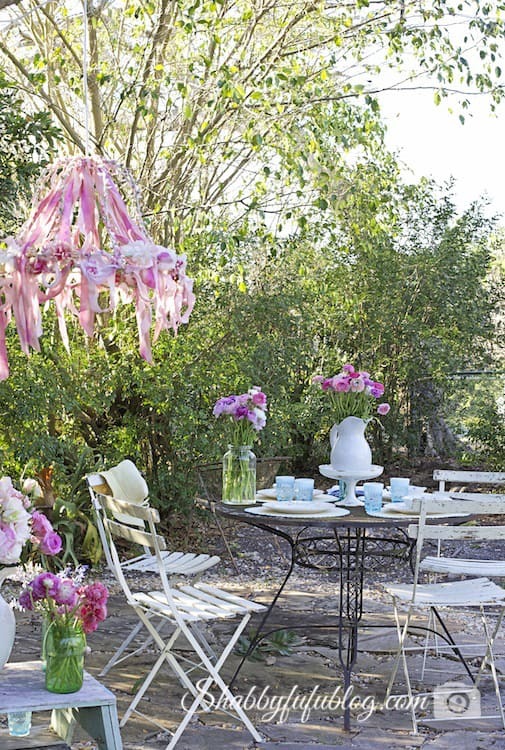 That outdoor chandelier is so perfect for your space! Thanks for opening your house. Thank you for sharing your house tour. It is absolutely delightful. I love your little dog. He looks like a sweetheart. I am sure he is very loved and adored! Oh Janet, it's such a wonderful year around home, even at Christmas. I comment on your sea painting, I love how transparent it feels when you look into the waters, and the sky of pink is so perfect for your home. 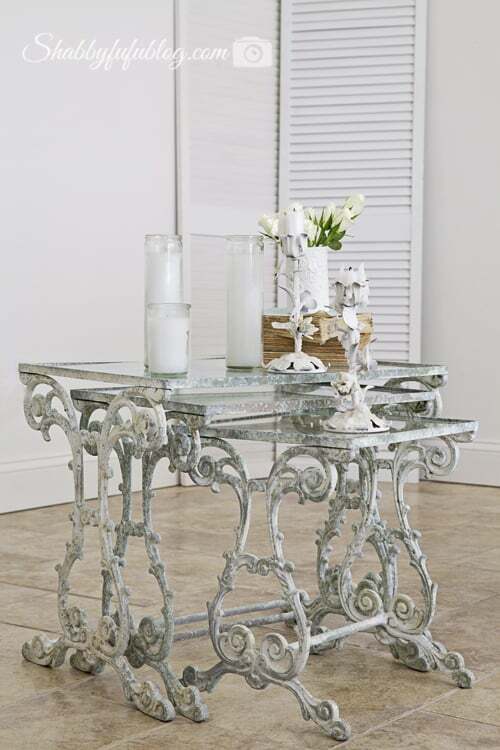 There is so much to comment on that I love, those iron nesting tables wow! And your French sofa, the little touches here and there pure and good. Beauty to your JUNE and the start of Summer. Your hoe is so lovely Janet. The colors truly are beautiful and peaceful. Thank you for taking me on the tour! Absolutely gorgeous, especially for an aqua lover like me! You have so much talent and sharing it with all of us is genuinely appreciated. Thank you! What a beautiful home. Love all the pops of beautiful color. Excited to be on this tour with you! 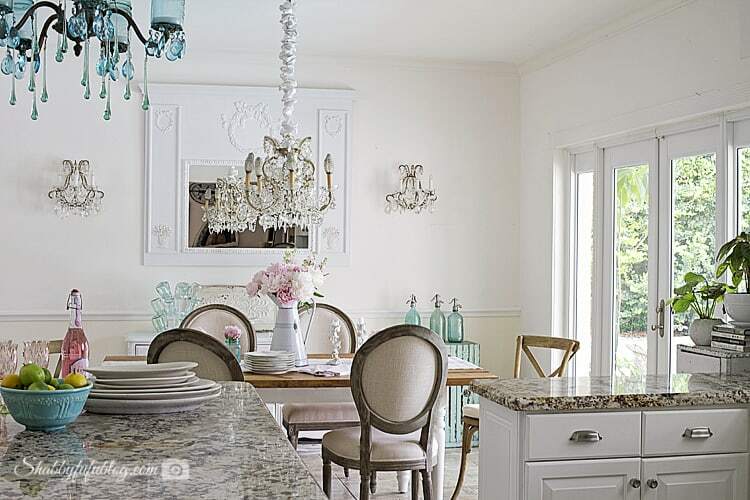 Love how bright and cheerful but relaxing your home looks-I want to come visit! As I scrolled through your pictures my heart was just melting with the beautiful colors you use. You really know how to make pastels pop. Love, love it! 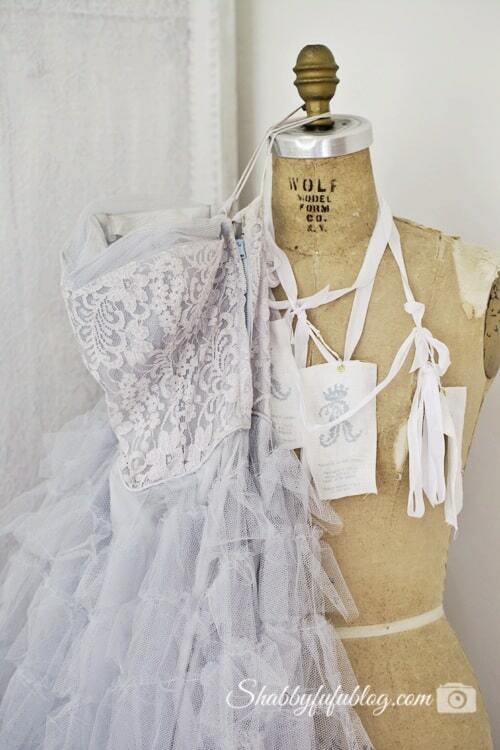 Pinning and pinning!